The government does not have even an inkling of the drought situation the people of the state are confronting," Pawar, 75, the three-time former chief minister said.He said farmers in Marathwada and other parts are getting destroyed by the drought but "the government is not doing anything for them". "If the government continues to neglect the farmers' demands, we will intensify the agitation... If the government takes no action by September 15, we shall launch a 'jail-bharo' agitation in the state. 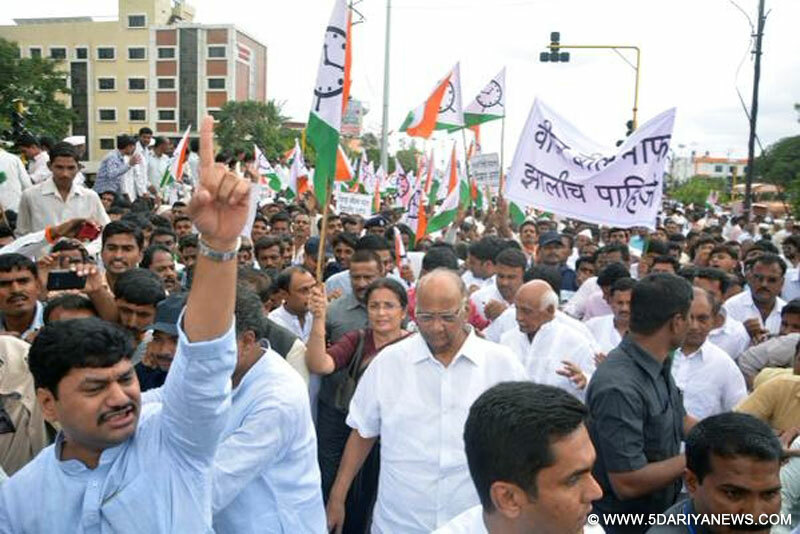 "We will also take our starving cattle to jail... Let the government make arrangements for us," Pawar warned as the gathering cheered. Leader of Opposition in the Legislative Council Dhananjay Munde said the government at the centre and state may abandon the farmers' cause, but the NCP will never do it and would always stand by them.Pawar's diatribe at the BJP governments came exactly six months after Prime Minister Narendra Modi visited him home in Baramati for a luncheon meeting on February 14 this year.On Wednesday, Pawar hosted top leaders of the Third Front in New Delhi and followed it up with a massive farmers' morcha in Osmanabad on Friday on the eve of Modi's customary Independence Day address to the nation on Saturday.